Go to the shopping mall, an outdoor festival, or even to your local cafe on a Saturday morning and you’re likely to see a service dog sitting quietly and obediently next to its owner. At first, it might catch you by surprise since animals aren’t typically allowed in public spaces, but if the dog is wearing a vest, it’s a quick and easy way to identify if it’s a “working” dog. Whether you have a service dog or just want to know more about what one does, we’ll discuss the benefits of using a service animal vest and a few of the myths about service dogs. Before we discuss the purpose of a service dog vest, it’s important to give a little attention to the furry four-legged companions who work hard and wear the vests. The American Disabilities Act (ADA) defines a service animal as “any guide dog, signal dog, or other animal individually trained to provide assistance to an individual with a disability.” A service animal isn’t always a dog, but the majority of people who rely on a service animal have a dog. As long as a companion animal meets the ADA’s definition, the animal is considered a service animal regardless if they are licensed or certified. Service dogs are trained to perform essentials tasks and other functions that its owner, who has a disability, cannot do for themselves. While service dogs are a loyal companion that lives with and accompanies an individual everywhere, they are not considered to be pets but rather a working animal. Even though service dogs are not considered pets, they receive much of the same love and care as a non-service dog. While many dogs have the potential to be a service dog, there are some breeds better suited to service specific disabilities over others. Depending on what an individual needs from a service dog, service dog training can take a long time. During their training, you may see a service dog in a training vest. These vests look similar to other service dog vests, but you may see a badge that says, “In Training, Do Not Distract” or something similar. A service dog must be able to perform any of their required tasks on command and be able to pass an Assistance Dogs International Public Access Test. During this test, the dog’s behavior and performance is evaluated in distracting environments, such as noisy streets or an area with a large crowd. The demand for a fully-trained service dog is high, and the waiting list is usually long. As an alternative, and to save money, many owners prefer to train their dog. Whichever way a service dog is trained, it should be house-trained and easy to keep under control at all times (especially in public settings). Is My Dog Suited To Be A Good Service Dog? Some individuals are faced with a disability later in life or have a family member with one. Many wonder if their beloved dog would make a suitable service dog. Your dog may be a good candidate if he or she is friendly, calm, alert, and is likes to (and can) be touched by all people, including strangers. Your dog should also have a strong willingness to please, follow you around, be socialized to a variety of environments, and be able to learn and retain information quickly. To assume that service dogs are all the same is similar to assuming that all disabilities are the same. The functions and tasks that service dogs learn to perform on a regular basis are unique and customized for each individual who relies on a service dog. Here are some of the most common types of service dogs. Guide dogs typically lead individuals with visual impairments or those who are legally blind. Golden Retrievers, Labradors, and Poodles are some of the most popular breeds to take on the roles of being a guide dog. While a guide dog may not wear a service dog vest, you are likely to see it wearing a service dog harness that has a handle on it for the individual to use while walking with the dog. People with hearing impairments may benefit from having a service dog who is trained to alert them to noises like alarms and doorbells. Small or medium mixed breed dogs like terrier mixes are often good candidates for hearing dogs, but many breeds are suitable. When this type of service dog hears a sound, they are trained to touch the individual with the hearing impairment and then lead toward the noise. Large breeds are best suited to be a mobility assistance dog because they must be big and strong enough to support their owner. A service dog who is trained to help someone with a mobility disability may press buttons to open an automatic door or retrieve objects. An invisible disability is best defined as a disability that is not immediately noticeable. Even if an individual isn’t legally blind or doesn’t rely on the use of a wheelchair doesn’t mean that they can’t benefit from a service dog. Dogs are trained to be diabetic alert dogs (DADs), seizure alert dogs, seizure response dogs, psychiatric service dogs (such as PTSD), autism support dogs, and allergy detection dogs. Each dog is trained to perform a unique set of tasks, and their role is just as important as a service dog who helps someone with mobility issues or visual impairments. Emotional support dogs are invaluable to their owners, but they are not considered to be a service animal. The main difference between an emotional support dog and a service dog is that an emotional, or even therapy dog) is not trained to perform specific tasks. Many people prefer to purchase an emotional support dog vest or a therapy dog vest for their support or therapy dog so that the public is aware of the dog’s role. The primary purpose of a service dog vest is to make the public aware that the dog has an important role as a service dog. Service dog vests come in a variety of sizes, styles, and colors. Most service vests are brightly colored so they are eye-catching and some patches indicate that the dog is a service dog. There are a variety of vest patches to choose from, but some of the most common ones are: In Training, PTSD, Do Not Pet, Do Not Distract, or Working Dog; you may see a combination of any of these patches on a vest. A service vest should fit the dog well so the dog can perform its tasks comfortably, accurately, and quickly. The material should also be breathable. Larger mobile assistance dogs may wear a tactical dog harness, as it’s often a more durable option and there are often pockets to store the owner’s personal items. Are Service Dog Vests Required? Service dogs are not required to wear a service vest, harness, or wear anything that identifies them as service dogs. As mentioned earlier, the individuals with disabilities are not required to have a licensed or certified dog or identification papers. Most individuals with a service dog do have a licensed or certified dog and carry around identification papers. Many service dogs also wear a vest or some other “gear” that states that they are a service dog. It’s also important to note that as a person with a service dog, you have certain rights. A business owner, for example, may ask if your service dog is required because of a disability, but the owner cannot insist on showing proof of your service dog’s certification before entering the establishment. Service vests can avoid confusion and even uncomfortable or awkward interactions. Vests can also make it easier to get through an airport or to get into a restaurant. Many dog lovers are happy to pet and interact with any dog they see, but a service vest can help avoid a service dog from being approached without the owner’s permission. Choosing to put a vest on your service dog can also keep you and your dog safer. If you’re planning on buying a service vest for your dog, there are thousands to choose from on the Internet. It’s important to buy one that is durable and is easy to clean. Your dog should be comfortable, and it should be comfortable and accessible for you, the user, as well. 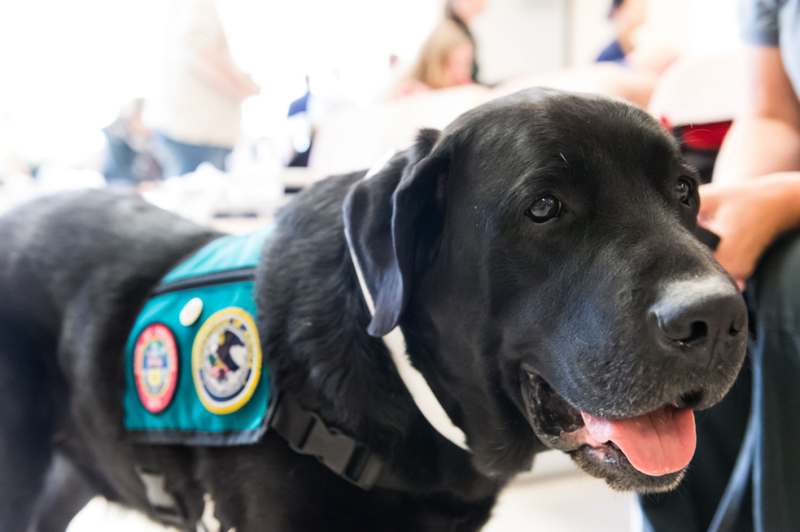 Connecting with organizations like The United States Service Dog Registry can help you learn more information about having a service dog and how to get a vest for your dog.